It is a knit Bee on a cord my friends, enjoy. 1 set of double pointed needles, whatever size you need to knit your yarn up tightly. I used US # 4. Note: Beginning with Rounds 1 and 2 in MC, alternate knitting 2 rows with MC and 2 rows with CC for Bee stripes. Round 2: [KFB] in each stitch. 16sts. Round 3: K all sts. Round 4: *K2, M1* repeat across row. 24 sts. Round 5: K all sts. Round 6: *K3, M1* repeat across row. 32 sts. Rounds 7-15: K all sts. Round 17: K all sts. Round 19: K all sts. Pause here, weave in cast on tail and stuff Bee body with fiberfill and cat nip, then continue. Round 20: *K2T* repeat across row. 8 sts. Round 21: K all sts. Note: Tie off CC1 now and leave tail inside of Bee body, continue using MC only for Bee head. Round 22: *K1, M1* repeat across row. 16 sts. Round 23: K all sts. Round 24: *K2, M1* repeat across row. 24 sts. Round 25: K all sts. Round 26: *K1, K2T* repeat across row. 16 sts. Round 27: K all sts. Pause here and finish stuffing Bee body and head with fiberfill and catnip, then continue. Round 28: *K2T* repeat across row. 8 sts. Cut yarn leaving approx. 6 inch tail. Thread tail through remaining stitches, gather and tie tightly. Weave in end. Row 2 and all even numbered rows: K to end. Turn. Weave in ends and sew to the Bee’s back. Pick up and knit 3 stitches in the center of the Bees back. Knit I-cord until cord measures approx 40 inches, BO. Make a finger sized loop at the end of the I-cord and use the tail of the yarn to stitch the loop shut, weave in any ends. Here’s Tess killing the bee in question. Great cat toy. This is so cute! And the kitty pictures are wonderful! I just wish my ninja cat didn’t kill and eviscerate stuffies before they have a chance to flee. Great kitty toy! You are my neighbour on the free pattern webring and I thought I’d drop in for a visit. This is great! I made it flat on 2 needles and then sewed up the seam. My cat loves it!! This is sooo cute! Thanks. Why? Cats are the most pretty and happy with their own pelt. I do like the toys, but not the sweaters. Don’t do this to our lovely cats! They have their own naturel wonderful and warm coat and they do not need this! The sweaters are cute but it seems like they’d really infuriate cats! I dont have a cat but would like to make some cat jumpers for xmas gifts, could you give me a pattern with the required no of stitches for a average size cat—as you say they have give & stretch, Thanks. Omg, I love cats! I have a gray one with a white belly. But its short haired….I want a white persion cat. Those are awasome! I love the description of the cat loving sweaters as much as sarcasm, is so true. I make sweaters for my little dogs and sometimes they get tried on a passing cat if the dogs aren’t about, always make that work so much more enjoyable when you’ve wrestled with the cat for awhile. My cats don’t need the sweaters but i work with cats at the humane shelter here and injured/mistreated cats do sometimes need something to keep them warmer, especially in the winter months. 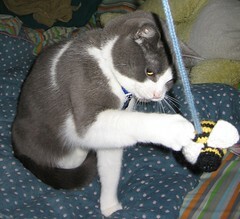 I’ve just found and knitted your wonderful bumble bee for my adopted 5yr Birman. She absolutely loves it and is a joy to watch as she chases it around the house. Could send a photo of cat and bee but unsure how I do this. I loved your comments about how cats love sweaters – you are obviously a cat person. Great job on the patterns. I can’t wait to delight (not) my grandkitties with gifts! Christine, your sweater for a cat pattern is one of the most well written I have seen in a very long time. There is NO reason it could not be used for a dog or a hamster or little lamb or goat or any other animal who gets cold. I have a short-haired dog, a Mountain Fiest, and here in Michigan it gets PLENTY cold and yes, he NEEDS his coat to go outside and sometimes, even needs a sweater in the house to stay toasty. I WILL be adapting this for my boy, and thank you. That bubmlebee pattern is one of the cutest I have seen for cats in a very long time, and I’ve made and sold cat toys at CFA-sanctioned Cat Shows for years and have seen a heck of a lot of toys. Now I’m wondering about adapting other little bug and insect toys (there are quite a few online) to put cords on them for toys, too. Wotta hoot! Thank you for this pattern. My Sweetheart’s cat, Reeces, will enjoy it soon. by the way — Happy Christmas! I can’t wait to make this for our year old tabby cat, Annie (Little Orphan Annie). A friend’s daughter found her at about six weeks of age starving and about to get hit by a car. I’ll add the bumble bee to her toy basket. Thanks for the pattern. These are all so cute!! There are way beyond my abilities right now though 😦 This winter I might try to get some help & knit the sweaters up for my 2 4 legged kids lol, here in NH they get so cold in the winter!